JNN 30 May 2014 Cairo : The election of Egypt’s former military chief to the nation’s presidency may be remembered for its central irony: He won in a historic landslide — only to shatter his image of invulnerability in the process. Abdel-Fattah al-Sisi’s win was never in doubt, but what the retired 59-year-old field marshal wanted was an overwhelming turnout that would accord legitimacy to his July ouster of Egypt’s first freely elected president — the Islamist Mohammad Mursi — and show critics at home and abroad that his action reflected the will of the people. In his last interview before polls opened, he exuberantly told Egyptians he wanted more than 40 million of the nearly 54 million registered voters to turn out. The reality was far more different. According to unofficial results announced by his campaign early Thursday, Sisi won 92 percent of the vote, resoundingly beating his sole rival, leftist politician Hamdeen Sabahi. However, the turnout nationwide was around 44 percent, Sisi’s campaign said. Not the worst of the multiple elections held the past three years, but well below the nearly 52 percent turnout in the 2012 election that Mursi won. 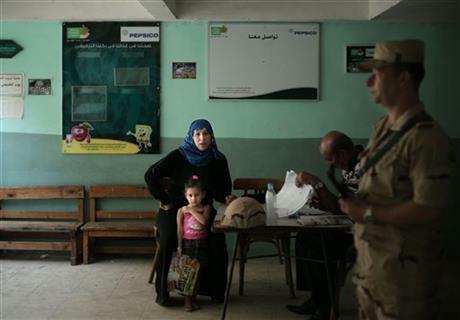 But several Cairo polling stations visited by AFP were deserted in the first hours of voting on Tuesday. The victory was tainted by the extraordinary means used by the military-backed government to get even that many voters to the polls. After signs that the turnout on the first of two scheduled days of voting on Monday was a lowly 15 percent, the government declared the next day a national holiday to free people to go to polls. The election commission threatened to slap fines of $70 — a hefty sum for most Egyptians — on those who did not vote. When on Tuesday polling still seemed low, the commission abruptly extended the election to a third day. The state made bus and train travel free to allow migrants to return to home districts to vote. Throughout the day, TV networks berated Egyptians as “ungrateful” and “traitors” for not voting. To many, it was clear the state was trying to help its favored candidate, reminiscent of machinations during the 29-year-rule of autocrat Hosni Mubarak, toppled in a 2011 pro-democracy uprising. And Sisi was not supposed to need a boost. For the past 10 months, the government, TV stations and newspapers have made him the object of relentless adulation, pinning superlatives on him as firm and efficient, empathetic and pious, manly and handsome, insisting he is the sole figure able to lead and feeding Patriotism for the military and police. Sisi can genuinely claim he comes into office with an impressive tally of votes — his campaign said he won 23.38 million votes. Official results are expected in early June. That’s more than the 13 million that Mursi won, and even more than the around 18 million votes that went to Mursi’s Muslim Brotherhood and allied parties in the first post-Mubarak parliamentary elections, the Islamists’ most resounding electoral showing. But the puncturing of his image is no small blow. It points out a significant pool of public discontent with Sisi and will likely encourage the Brotherhood in its protests, hoping more Egyptians will join its ranks if the new president fails to improve their lot. It gives hope to the more secular, pro-democracy revolutionary groups, signaling that Egyptians are as wary of a military man in power as they were of the Islamists. It also served notice that Egyptians can still pull off stunning surprises — and that after rising up against two presidents since 2011, they expect more from a politician than heroic status. Many Sisi supporters voted enthusiastically, singing and dancing at the polls, saying they had confidence that a man from the military can bring stability after three years of bloody unrest. Equally appealing were his comments on the merits of moderate Islam and his intention to fight extremism. The boycott by the Brotherhood, which has the country’s strongest get-out-the vote-machine, heavily gouged the turnout numbers. But many others who declined to vote — and even some who voted for Sisi — said he seemed to take Egyptians for granted and lacked solutions for millions living in poverty. They were struck by how he showed little tolerance for dissent, was dismissive of freedoms and rights and was strongly backed by former members of Mubarak’s ruling party — all fueling concerns he will bring back Mubarak’s autocratic ways. “This man will seal the gates of democracy behind him with a lock and chain. It will be our last elections, and it is a farce,” said Ramadan Salem, a 57-year-old boycotter who was sitting among fellow taxi drivers sipping tea under a main bridge in central Cairo. Even Sisi’s campaign motto — “We work together” — struck Salem as a way to evade responsibility. “When he fails, it will be us failing, not him,” he said. Sisi acted presidential long before the first ballot was cast. Unlike Sabahi, the only other contender in the race, Sisi never went into the streets to campaign, instead giving TV interviews and holding meetings in opulent surroundings with influential groups like editors, businessmen, celebrities and clerics. His straight talk on the extent of economic problems rang harsh to some, telling already struggling Egyptians to buckle down and sacrifice. Promising “great leaps,” he gave mixed signals on his policies. He advocated heavy government involvement in the economy with state-sponsored mega-projects to create jobs and even in setting market prices. At the same time, he flirted with businessmen, saying he planned to give them a share. He spoke of reshaping the map of Egypt by expanding Nile Valley provinces into the desert to redistribute population. His answer for funding it was billions of dollars from oil-rich Gulf nations and from Egyptian expatriates. Sisi has led the harsh crackdown on Mursi’s supporters that has killed hundreds and jailed thousands. It has also imprisoned secular-leaning dissenters and brought reports of abuses of detainees, random arrests and lack of due process. In interviews, Sisi insisted stability has priority over rights of speech and protest. He was Rough and Bossy at times, snapping at interviewers for perceived slights of the military. That worried some even beyond the ranks of revolutionary activists. This entry was posted in AFRICA, Middle East and tagged Egypt, Egyptians, field marshal, Field Marshal Abdel Fatah al-Sisi, Hosni Mubarak, Land slide Victory, Low Turnout, Mohammad Mursi, presidential elections, Sisi. Bookmark the permalink.